You are here: Home » Monitors. Two are better than one. Yes they are! Monitors. Two are better than one. Yes they are! I have taken a little abuse over the years for having a dual-screen setup on my computer. Especially when I first did it about 10 years ago. Over the years there have been debates to justify it but it has come up again a few times recently when some saw my setup. 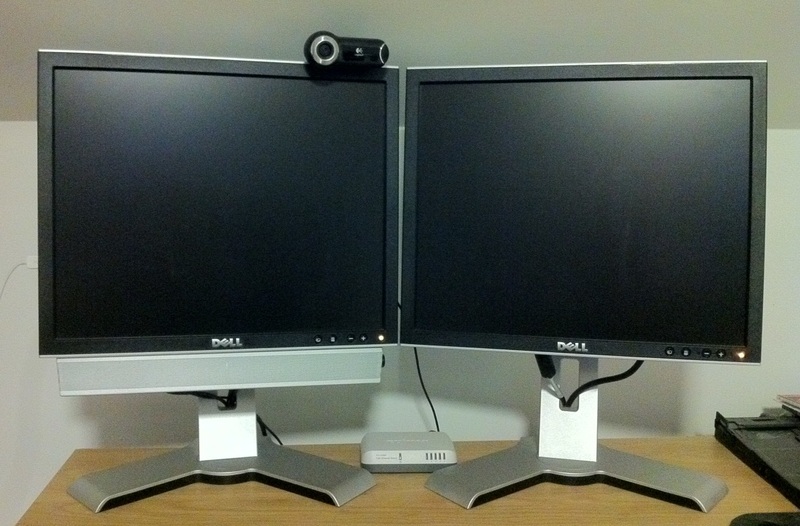 At home I have 2 x 17″ standard Dell monitors and yes the work office is a little nicer with 2 x 21.5 Dell HD monitors – see pic below. Comments over the years are its unnecessary, silly, trying to look important, waste of money, for techies and geeks only and the best one – a ploy by manufacturers to sell more. This all despite the fact that there are plenty of trials and reviews that show it both helps in productivity and reduces errors (There are a few studies with some claiming 10%-50% productivity increases. The 50% is pushing it more than a little in my view but even if its only an 8%-10% increase over the course of the life of the monitor that is a lot of extra work completed without any extra hours in front of the computer!). Yes there is a cost and yes you use more electricity but I would argue against both of those apparent negatives with the increased productivity it offers and say that over time it actually saves\makes money. I have had dual screens for a long time, both in work and at home. Monitoring helpdesks, system dashboards, remote sites, multiple spreadsheets, documents and systems in general it just always worked so much better. Over the years I have asked colleagues in different companies and areas of the organization to give them a try. People who are not generally in IT, people who spend large hours of the day in front of a computer and looking to improve their productivity and computer experience. Gradually many have come on board. The fact that once they start they wont give them up only speaks volumes to the fact that it works. It’s not a novelty or a ‘look important’ gimmick. It’s a real value add that they appreciate. I would also say that two smaller would be better than one larger even though the newer operating systems can auto split your screen and auto size applications to the left or right side. There is still something about the physical monitor border that just works better. The average office worker should get at least 2 x 19″ wide-screen as opposed to say 1 x 21″ or 1 x 24″ wide-screen. Yes of course there may be cases when a 24″ is better for video editing, graphics, etc. I am not talking about specialised cases. I am talking about the office worker that lives in general applications and versions of materials. The average office worker in IT, Finance, Investments, HR, Architecture, Engineering and the list goes on. I have to admit I am surprised at how slow this is to become standard in the modern office where we appear to value high productivity and efficiency. The old problems of space with the big CRTs and the cost in both monitor and upgrading the PC are essentially gone. Most PCs and laptops can deal with dual monitors already with possibly only the need of an extra cable required. That combined with very cheap flat screens now easily available and flat screens taking up a smaller space on the desktop there is no excuse for most not to at least look at this change. Every day of the week, and twice on Sunday two screens are better than one. Yes they are!